This seems to me a useless aspect of the game. What do I care if my avatar gets a rare pair of socks? Am I missing something about the nuance of gear? Has anybody spotted the M.Rossi suit in the new Race Shop? Last month I spent 30,000,000 dollars buying loot boxes trying to get it. The reason I like the M.Rossi Suit is that it is Plain Black - No reflections in the windshield and it doesn't have any of the Bozo the Clown accoutrements. 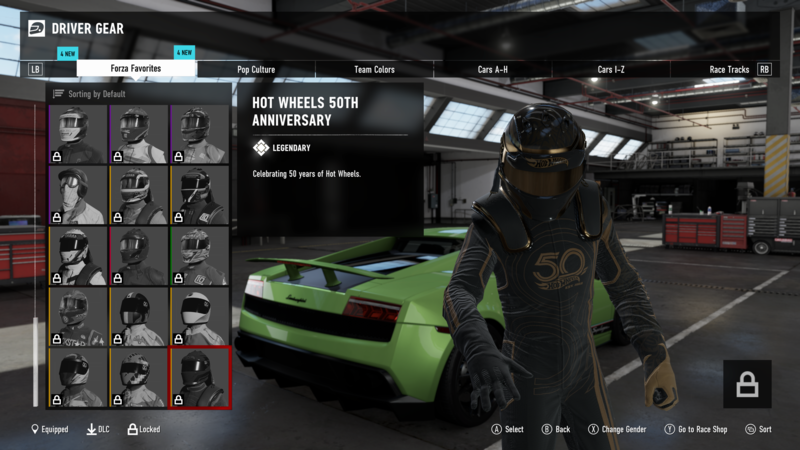 The website stated that in the new patch they would gift everyone the Hot Wheels 50th Anniversary suit. I've been looking in game but I cannot find it anywhere. Any ideas? Can we find all the driver gear in the shops? Which are not available in this new shop? I'm guessing the pre-order suits, Forza rewards, Forza RC and the Halo & minecraft aren't in. All others, the ones you can see in the driver gear menu, are in based on what I've already seen. And I'm streaming Forza to my laptop while watching TV so I've seen alot of rotations. I believe that the ones highlighted would be included!!! I think all DLC/gift only suits are not in the race shop including Forza Rewards, ForzaRC, pre-order, promotions, Halo/Minecraft/Gears of War and of course the career suits. Maybe the special day suits, too? Just in Forza 7. In older forzas he was a guy (as per driver descriptions in the game). I would love the Forza RC and Forza rewards driver suits available as well. Missed the Forza RC one, received all kind of FH driver suits in the rewards, even when I didn't play them, and didn't get Forza 2,3 and 4 which I played the most. That was a bad rewards decision IMO. Does anybody got the new BMW Racing Suit in the Race Shop or is it a Reward for doing a specific Rival Event ? I thought so too until I booted up the older games and nowhere is Rossi mentioned as a guy. Mandela effect perhaps? @ManteoMax, will there be other opportunities to earn the reward suits (ie Forza RC, Forza RC Seattle, Safe and Sane, M. Rossi, Wolf Pack, etc)? I'm missing a few due to missing out on earning them when they were available because of work and other reasons. Please release them on the Race Shop, or provide future #Forzathon challenges with these suits. I really want to complete the collection. I think M. Rossi driver gear is available trough the racing shop, at least I picked up the Sasaki and Muller ones. But yes, would be great if T10 people could answer what is available and what not. I would love that Forza RC suit as well. I don't know for certain but I would not expect special event suits like the ForzaRC ones to come up in the Race Shop. Maybe they'll come back for future ForzaRC stream rewards. I haven't noticed the original Loyalty Rewards suits come up in Race Shop, but since the new rewards only provide Mods, the FH and FM suits may pop up. I have Baller, so that must be in the race shop. Thank you for shedding some light on the matter. I do hope to see the rest of Forza Favorites, Pop Culture, Cars, and Pattern General to be in the Shop. As for the Forza RC suits, I hope they will be rewarded later on. Thanks MM! Special day suits are in the Race Shop. I saw the Valentines suit the other day. Thanks for the list. That will help with my quest. I am still missing 12 (plus the Hot Wheels ones), 8 of which are on your list. For some odd reason i am still missing the Camo green one of all things. Exact same 8 gears are missing here. At this point I think it's save to say, that these 8 gears are not available via the Race Shop right now. Multiple people are missing the exact same gears. The restock is not synced by any server. Just 'random' local. Already tested with 2 accounts at the same time online ... with totally different offers inside the Race Shop and an individual reset timer. The shop is also available when offline. Just created a support ticket to get an answer if these 8 are missing on purpose from the random rotation, or it is a bug and they are just accidentally missing. I just picked up Baller myself tonight. I think Saint Nick and Ugly Sweater Party are pretty obviously held for seasonal rewards or gifts. Earth First was added in March and may have been intended for Earth Day (April 22) but for whatever reason wasn't released. Safe and Sane too looks like it was added (in June) for Independence Day. And maybe the recent addition of BMW might mean it's being prepped as a contest or Spotlight reward as Hyundai was earlier this year.